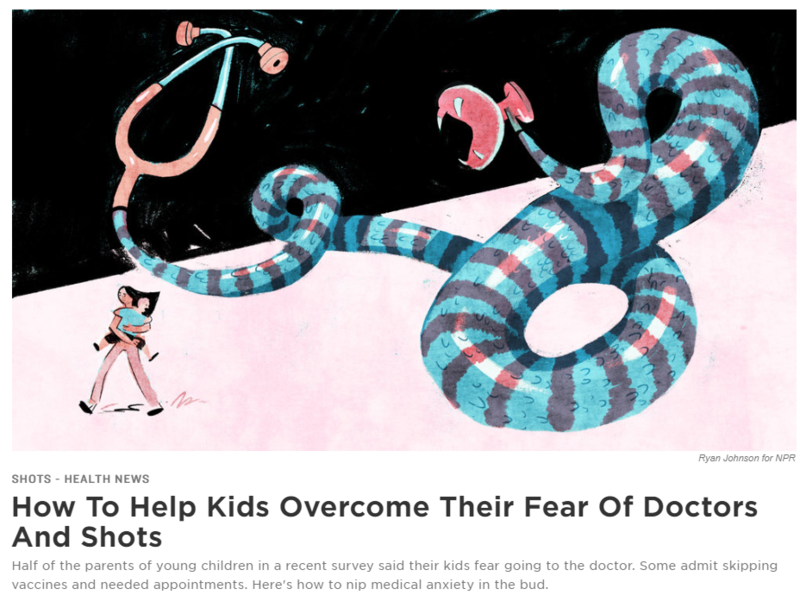 Sasha Albani, a child and adolescent psychotherapist… suggests parents calm themselves and find age-appropriate ways to help children face their medical fears instead of fleeing them. For very young kids, who have a hard time putting words to thoughts and emotions, imaginary play with mom or dad before the appointment can help, Albani says. Children under age 6 may benefit from the book, “Daniel Visits the Doctor” by Becky Friedman. Kids with needle phobias may be helped by reading, “Lions Aren’t Scared of Shots: A Story for Children About Visiting the Doctor,” by Howard S. Bennett. And the book “Imagine a Rainbow: A Child’s Guide for Soothing Pain,” by Brenda S. Miles, may be useful for older kids between the ages of 8 and 10. Playing The Coping Skills Board Game can bolster the confidence of preteens… And smartphone apps like “Stop, Breathe & Think Kids” can be a fun way to learn mindful breathing techniques and other relaxation tips that help turn down the alarm of worrisome feelings.